Socialization is one of the most popular buzzwords in dog rearing/training. It is a term that is often misunderstood. Too often socialization comes to mean something you do by taking your dog to an obedience class for a few weeks or by walking the same route through the same neighborhood each day. Instead, it should be an ongoing, lifelong process. I prefer to think of the activities and events we share with our Greyhounds that help them learn to enjoy new situations as life skills. Having an emotionally healthy, happy dog requires more than good intentions, a great yard, lots of toys, or the biggest, softest bed on the block. Every dog needs exposure to new situations, people, activities, and places. 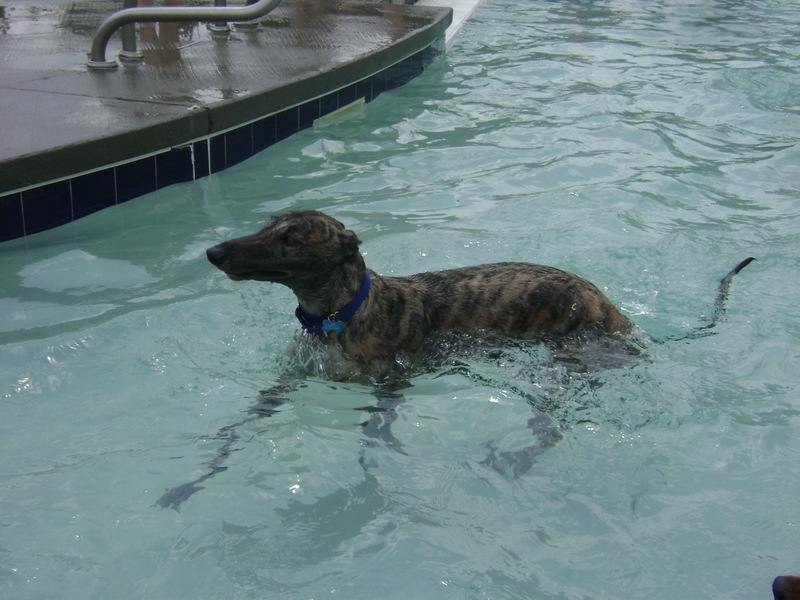 For retired racers, this introduction to life’s adventures is more important than for other dogs because many everyday things are so foreign to the life they had at the track. And, as with all dogs everywhere, most Greyhounds find new or strange things to be at least a little scary — sometimes very scary. You can’t pop off to the park or do a meet and greet every few months and expect your hound to be as comfortable there as he is at home. If you want him to have fun, you need to regularly expose him to fun activities and help him develop the self-confidence he needs to cope with new or difficult situations. Regardless of your hound’s age, the more you get him out and about the more comfortable he’ll become with strange people, dogs, places, and situations,so get started. It’s never too late. Life skills are as important to your hound as they are to your children. Try to find a way to increase his world’s view each day. Here are some ideas and some tips for making the most of your hound’s experiences. Always keep your mood calm and happy. Make generous use of high value food treats so he associates these adventures with neat stuff. To make a lasting impression on your hound, leave the kibble and Milk Bones® at home. Instead, use bits of roast beef or roast chicken. Give treats to children and strangers so they can offer them to your hound. If he is already fearful of strangers or children, talk to a good trainer or behavioral consultant about ways to help him overcome his fears. Walk through your neighborhood and arrange for him to meet and greet neighbors, particularly children. Instruct them to greet him properly. If your hound is a bit shy, have the person gently toss a treat or two to your hound. Ask them to kneel or crouch rather than bend over your dog. Have them turn so they are turned slightly to the side rather than facing him head on. Let your hound approach the person. Tell strangers not to reach at your dog from above his head. Have them wait to pet him until he approaches them. And ask them to pet him by reaching gently upward under his chin. Gently touch the under side of the chin. Let them continue only if your hound is having a good time. And no hugging, please. Hugging a strange or fearful dog is asking for a dog bite. Do at least one of these activities each week. At first, keep a safe distance so your hound isn’t overwhelmed. Pick times of the day when foot or vehicle traffic is light. Move closer to the center of the action or nearer to the crowds as he seems eager to greet new people and experience new activities. Walk near school bus stops, schools, and day care centers so he can greet children. Start at a distance so lots of giggling, screaming children don’t rush him. Walk near nursing homes so your hound can meet people using walkers and wheel chairs. Take him to the vet’s office and let the staff make a fuss over him and treat him. Then leave. That way he won’t associate the vet’s office only with bad stuff. Do the same with the groomer if you use one. If you live in a rural or very quiet suburban area, walk your hound at outdoor malls and shopping centers. Later try a downtown area where there is more traffic and noise. Most area pet stores welcome pets. Take advantage of their hospitality. Always be prepared to clean up after your hound. More and more places are off limits to dogs because of irresponsible owners. Let’s try to reverse that trend. And don’t forget to take a gentle, dog-friendly training class. Nothing builds your hound’s self-confidence as well as creating a relationship and a way to communicate with his favorite human and caretaker — you. CG SP 02 ALL RIGHTS RESERVED. This article and any photos or artwork contained within may not be reproduced or reprinted without express written permission from the author, artists, and/or photographers.